What can you give to somebody who loves Yoga this Christmas? The best thing about a present is that our friend or loved one who receives it notices that we thought about him or her at the moment of choosing it. That it is, in fact, something very special. Not long ago, at a gathering with friends, one of them asked us for any Christmas recommendations for people who love Yoga. She didn’t know anything more specific about the person, but wanted to be sure that he was going to enjoy it. So, a new mat?, a surprise dinner at a vegan joint?, a box of yogi tea? One of these friends recommended a life long gift, something that does not lose relevance through time. This suggestion can be seen as a book, perhaps one of the most beautiful words in the world. This is easier said than done. Finding the right book for a gift is always a daunting quest, for there are millions of them already, not to mention thousands and thousands more that are published every day around the world. How could we choose? We at Yogalinda have the answer. 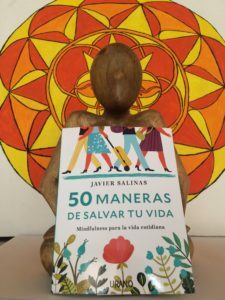 Not long ago, Javier Salinas, one of our instructors for two years, published a wonderful book called Fifty ways to save your life (50 maneras de salvar tu vida, Urano, 2017). It is a beautifully designed book, with wonderful cover art, bright colors and a carefully selected typography, detailed pages and helpful advice. It is the kind of book that you should have at your bedside table, so as to read a little bit before bed or after waking up. Or perhaps you could display it at a special, but visible, spot in the house, so that anyone can read a little snippet of it at any moment. It’s not a book exclusively for yoga practitioners, it is good for everyone, just as it reads on the cover: “Mindfulness for daily life”. You can give it to a special friend, somebody in your family, your partner or a coworker. Anyone will be grateful to have at hand some of Javier’s tips to improve their lives. As the title says, they’re fifty practical meditations for different kinds of situations. There’s also a selection of poetry and magical exercises. We think you might also like one of his other books by Javier: Happiness, a user’s manual. How to be everything that you love, which has been reviewed as well on this blog. You can check some of his other books at yoga-you.